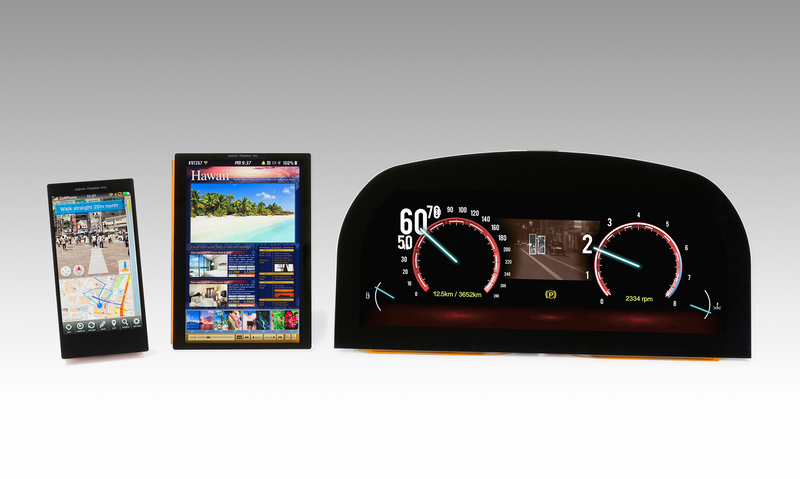 Japan Display Inc. (JDI), a global leader in LCD technologies, has developed three display prototypes -- named "Innovation Vehicles" -- for smartphone, tablet, and automotive applications which will be shown at the FPD International 2012 exhibition in Yokohama, Japan. The Innovation Vehicles incorporate and integrate advanced technologies from each of JDI's three original companies*1, and serve to bridge our customers' product concept and product development activities. The Innovation Vehicle for smartphone applications features key technologies for forthcoming high-end smartphone applications adopted into a large 5.0-inch diagonal size module with full HD resolution (1080 x 1920 pixels) and pixel density of 438ppi*2, with high contrast ratio of 2000:1*3 achieved by implementing new in-plane switching (IPS) technology, with low power consumption that is approximately 50% less*4 by utilizing an RGBW pixel structure, with a thin module structure of only 1.0 mm thickness including an integrated touch function (without cover glass), and with a narrow border of 1.0 mm. The Innovation Vehicle for tablet applications features key technologies adopted into a 7.0-inch diagonal size module with high WQXGA resolution (2560 x 1600 pixels) and pixel density of 431ppi, with high contrast ratio of 2000:1 achieved by implementing new IPS technology, with low power consumption that is approximately 50% less*4 by utilizing an RGBW pixel structure, with a thin module structure of only 1.3 mm thickness including an integrated touch function (without cover glass), and with a narrow border of 1.5 mm. The Innovation Vehicle for automotive applications features a 12.2-inch diagonal size module with 1920 x 720 pixels resolution. 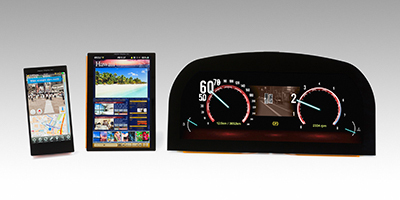 The display adopts advanced technologies desirable for next-generation automotive displays such as true-black appearance, styling design freedom enabled by corner cut and curved surface technologies, low power consumption (approximately 50% less*4), and integrated touch function. JDI will demonstrate these three Innovation Vehicles in booth #2701 at FPD International Japan 2012, held October 31 through November 2, 2012, in Pacifico Yokohama, Yokohama, Japan. *1 Toshiba Mobile Display Co., Ltd., Sony Mobile Display Corporation, and Hitachi Displays, Ltd.